Did you receive this form? If you received a Juror Qualification Questionnaire from the U.S. District Court, you are being considered for jury service. However, this is not a summons for jury service and you are not being called to report at this time. The form is used to obtain information about you so that we can objectively determine whether you are qualified to serve as a juror. 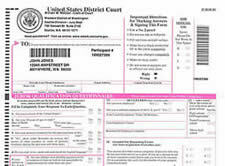 You must complete and return by mail, or on-line using eJuror within 10 days of receipt. Have a question about this form? The jury staff has provided a list of frequently asked questions available here.